For some reason Crewdson Road and South Island Place took quite a battering in the Blitz, perhaps due to their curved shape making them stand out from the air, whatever the reason it all began on the afternoon of Tuesday 1st October 1940. 2.10.40 7:12 AM Supplementary Report Crewdson Road between Brixton Road & Clapham Road. 14:06. High Explosive. 45 Demolished. Casualties - 3 slight. RP/R arrived. Debris cleared. Owing to dangerous condition of buildings on Crewdson Road, road blocked. Roofs, windows, chimneys and chimney pots damaged in the vicinity. Homeless at 43,45 & 47 made arrangements for accomodation with friends. 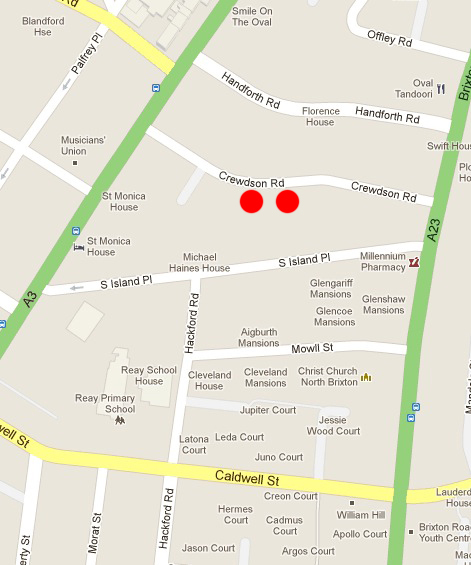 All occupants of these three houses have been traced. 2.10.40 07:21 South Island Place 14:06 - High Explosive bomb. Slight damage to no 45 South Island Place - no casualties.